Premature infants who developed significant SGS in the past most often required tracheotomy tube placement, followed by a prolonged period of weaning from elevated oxygen levels as their pulmonary status improved. See the image below. For many decades, SGS was not able to be corrected by a surgical procedure. Now, through laryngotracheal reconstruction, surgeons can enlarge the narrowed segment of the infant's trachea and achieve successful removal of the tracheotomy tube. This surgical advancement was finally attained by the collective work of numerous surgeons who developed open surgical repair of the injured cricoid and tracheal rings. This procedure has been named laryngotracheal reconstruction (LTR) or laryngotracheoplasty. LTR was developed in the 1960s and 1970s by numerous prominent surgeons working in Europe, Canada and the United States. Among the most prominent were Drs. Bertel Grahne, John Evans, George Buchanan Todd, Blaire Fearon, and Robin Cotton. They designed LTR as an operation that increases the airway lumen by splitting the narrowed segment of cartilaginous rings and then suturing harvested cartilage grafts to increase the lumen’s diameter of the trachea. Successful LTR thereby creates a larger airway and improves and often alleviates the airway obstruction, allowing for the tracheotomy tube to be removed and the child to be decannulated. Patients require LTR because of laryngeal or tracheal stenosis, complete atresia, or in rare cases severe tracheomalacia after tracheostomy. SGS, or severe narrowness of the airway, can be either congenital or acquired. Congenital stenosis occurs from failed recannulation of the airway during embryonic development. Acquired stenosis is the result of an inflammatory process or insult from the endotracheal tube. Balloon dilation of the airway has been performed prior to open airway surgery. See the images below. 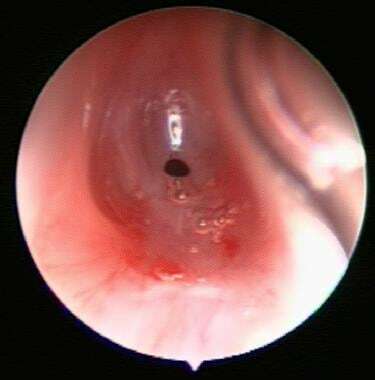 The pediatric larynx is approximately one third the size of that of an adult, with the most narrowed portion being that formed by the elliptical or signet shaped cricoid cartilage ring. The subglottis, from the lower surface of the true vocal cords to the inferior surface of the cricoid, is the narrowest aspect of the pediatric airway. The tracheal narrowing can involve several segments of the airway, may be secondary to complete tracheal rings, and can be firm or soft, circumferential or longitudinal, smooth or irregular, mature or immature. The subglottis is defined as the area extending from the lower surface of the true vocal cords to the lower surface of the cricoid ring. 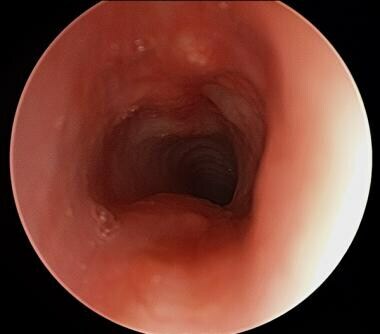 The pediatric larynx is approximately one third the size of that of an adult, with the most narrowed portion being that formed by the signet shaped cricoid cartilage ring. The infant larynx is positioned higher in the neck than the adult larynx; the cricoid is positioned approximately at the fourth cervical vertebrae. In comparison, the adult cricoid rests at about the level of the sixth cervical vertebrae. The normal subglottic lumen diameter in the full term neonate range from 4.5-5.5 mm and in premature babies is approximately 3.5mm. A subglottis of 4 mm or less in a full term neonate is considered narrow. 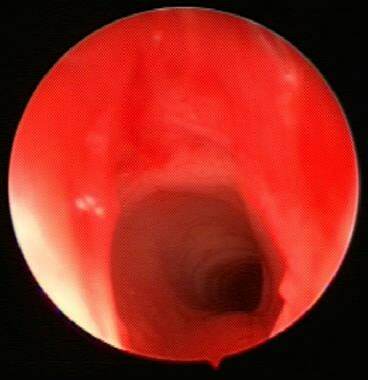 A child who is symptomatic from SGS requires surgical correction of the airway. LTR is the most reliable treatment for Cotton-Myer Grades II or III. The lower Grade I is treated with either dilation, or cricoid split surgery. 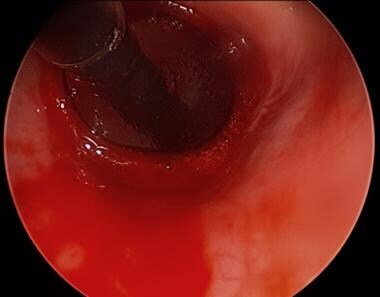 Grade IV stenosis is more challenging and may require, tracheal resection, slide tracheoplasty, or permanent tracheostomy. Balloon dilation of the airway has been performed prior to open airway surgery. See the image below. In select patients, balloon dilation can be performed in lieu of LTR, or in severe cases of Grade III stenosis, in combination with LTR. Oftentimes, the dilation is performed after LTR during the initial healing process to further improve soft tissue swelling, edema, and granulation tissue from the incorporating graft. The success of laryngotracheal reconstruction is generally defined by overall decannulation rates and voice quality. Excellent results have been reported for both single-stage and double-stage procedures. See the image below. Decannulation rates are typically higher for single-stage LTR but this is likely due to the increased disease severity in patients who undergo double-stage reconstruction. McClay J, Isaacson G. Pediatric Subglottic Stenosis Surgery. Available at http://emedicine.medscape.com/article/995328-overview. Accessed: Assessed August 1, 2012. Myer CM 3rd, Cotton RT. Historical development of surgery for pediatric laryngeal stenosis. Ear Nose Throat J. 1995 Aug. 74(8):560-2, 564. [Medline]. Zalzal GH, Cotton RT. Glottic and Subglottic Stenosis. Cummings Otolaryngology Head and Neck Surgery. Philadelphia: Mosby Elsevier; 2010. 2912-2924. Myer CM 3rd, O'Connor DM, Cotton RT. Proposed grading system for subglottic stenosis based on endotracheal tube sizes. Ann Otol Rhinol Laryngol. 1994 Apr. 103(4 Pt 1):319-23. [Medline]. Guarisco JL, Yang CJ. Balloon dilation in the management of severe airway stenosis in children and adolescents. J Pediatr Surg. 2013 Aug. 48 (8):1676-81. [Medline]. Choi SS, Zalzal GH. Pitfalls in laryngotracheal reconstruction. Arch Otolaryngol Head Neck Surg. 1999 Jun. 125(6):650-3. [Medline]. Smith LP, Zur KB, Jacobs IN. Single- vs double-stage laryngotracheal reconstruction. Arch Otolaryngol Head Neck Surg. 2010 Jan. 136(1):60-5. [Medline]. Cotton RT, Gray SD, Miller RP. Update of the Cincinnati experience in pediatric laryngotracheal reconstruction. Laryngoscope. 1989 Nov. 99(11):1111-6. [Medline]. Morita K, Yokoi A, Bitoh Y, Fukuzawa H, Okata Y, Iwade T, et al. Severe acquired subglottic stenosis in children: analysis of clinical features and surgical outcomes based on the range of stenosis. Pediatr Surg Int. 2015 Oct. 31 (10):943-7. [Medline]. Table 1. Severity of subglottics stenosis as determined by endotracheal tube size with leak at 10-25 cm of water.